Ample worthwhile reporting broke out during Wednesday's late night newsers, which also featured gang coverage of Sarah Palin's appearance at the Majestic Theatre in downtown Dallas. Let's first get to some of the good stuff. NBC5 really isn't into lengthy investigative reporting, but makes occasional exceptions for Scott Friedman. 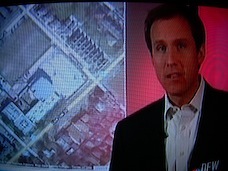 His principal venue is the station's early morning newscasts, which he co-anchors with Deborah Ferguson. Friedman sometimes gets a chance to stretch, though, and remains one of D-FW's more capable enterprise reporters when he does. Friedman took an in-depth look at whether neighborhood police "storefronts" really are much of a crime deterrent. Some small business owners think not. A convenience store located in close proximity to a miniature cop shop has put up concertina wire after repeated robberies. In another instance, a man was stabbed right behind one of the police storefronts. Police records examined by Friedman showed that "dozens" of recent crimes have occurred in the very near vicinity of these neighborhood police centers. One clear reason is that "in Dallas, most storefronts shut down at 5 p.m.," Friedman told viewers. He also interviewed a police spokesman who said "storefront approaches do work" in limiting crime. And Friedman cited an example of an apartment complex where break-ins were epidemic until a neighborhood police presence was established. His overall conclusion: "Simply living across the street from the law is no guarantee that crime won't live on your block." It was a sturdy, informative story, with Friedman given ample time to air it out. ***The major vandalism of Plummer Elementary School in Cedar Hill by knuckle-dragging dunces got the attention of several stations. But CBS11 brought it all home by leading its newscast with the quick turnaround clean-up by Plummer's teachers and students. Their efforts and teamwork enabled the school to be re-opened Thursday after just a one-day shutdown. Recently hired freelance reporter Andrea Lucia, who previously worked at KHOU-TV in Houston, reported live from the school's sparkling hallways after her taped story showed both the extent of the damage and the determination to clean it up. Mission accomplished, with Lucia offering vivid proof to viewers by staying in place Wednesday night. ***On WFAA8, reporter Gary Reaves was the latest to embody the station's "Crossing State Lines" promotional campaign. He journeyed to Utah to look at a new device that shuts down a cell phone's texting capabilities when a vehicle is in motion. The local angle was a University of Texas business school grad whose Salt Lake City-based company is marketing the gadget. WFAA8 anchor Gloria Campos set the table for Reaves' story by noting that more than 16,141 deaths in the years 2001-07 have been attributed to texting behind the wheel. Many of the fatalities have been teenagers. So Reaves' trip can be judged worthwhile under the circumstances. ***In contrast, Fox4 stayed close to home -- and in the studio again -- for co-anchor Heather Hays' show-and-tell of graphic, government-funded anti-smoking labels that must appear on cancer stick packages by June of next year. An adman named Wayne Walker joined Hays to walk through four of the labels. One shows a rotting smoker's lung next to a healthy one; another is an up-close look at badly stained teeth and an accompanying lip sore caused by smoking. "Who would want to kiss this mouth?" Hays asked rhetorically. She also noted that she'd been a smoker herself until quitting when the price per pack got too high. As noted previously in these spaces, Fox4 increasingly is using its anchors as in-studio interviewers. The cigarette segment proved to be a joltingly good example of how this can work quite well. AND IN OTHER STUFF . . .
All four stations had reporter-driven stories on Palin's Wednesday night appearance at the Majestic on behalf of the pro-life group Heroic Media. Texas Gov. Rick Perry and Dallas mayor Tom Leppert also were along for her ride, with Palin of course declining to take any questions from the "mainstream" media because, well, they're all the equivalent of Commie pinkos. CBS11's Jay Gormley tried to make the most of the situation anyway after co-anchor Karen Borta said that "Palin seems to like Perry and Perry seems to like Palin. And both are rumored to have presidential aspirations." Gormley showed Palin extolling Perry during her speech as "a man that I dearly love and respect." And Perry, who also signed copies of his new book at the event, acknowledged on camera that he once considered running for president but now wants to stay put in Texas after again being reelected as governor. CBS11 political analyst John Weekly said that Palin "has a lot of baggage, and I think that baggage would be there to exploit." Gormley took it from there, telling viewers in his closing standup: "Weekly agreed that a Palin-Perry political pairing would generate tremendous interest, but says it would likely be the type of interest the Republican Party would rather avoid." ***Also on CBS11, investigator Jack Fink looked into questionable claims-dodging by the United Automobile Insurance agency. Two motorists hit by drivers with United policies said they were stiffed when the agency said it couldn't locate its own customers. They then had to file claims with their personal insurance companies, even though neither driver was at fault. Fink visited the agency and encountered a pair of standard-issue pot-bellied spokesmen who claimed that everything was above-board. Shortly after his visit, one of the aggrieved motorists said she'd been contacted by United and offered a refund after the company located the customer it somehow couldn't find before. Fink, who had found one of the United customers on his own, spiked his voice inflection with a sprinkle of sarcasm in relating this turn of events to viewers. But in this case he was entitled. ***Fox4 co-anchor Steve Eagar handled a newscast-closing "Viewers' Voice" query from someone who was sick of reporter Shaun Rabb's trademark signoff -- "Shaun Rabb. Fox4 -- pause, one, two -- news." The viewer wondered why he keeps doing that. "Why is the sky blue?" Eagar retorted. "Why can't we all just get along? Why does Shaun pause? All powerful generational questions that I can't answer. I really think it's just his thing, ya know." It made him sound like one of those aforementioned United Automobile Insurance guys. *** Finally, WFAA8 sports anchor Dale Hansen took another two swings at his favorite pinata -- Dallas Cowboys owner Jerry Jones. With Jason Garrett the team's new head coach, "Jerry Jones thinks they're a Super Bowl team now," Hansen said. "Well, I made that last part up." After reporter Joe Trahan's dispatch from Valley Ranch, Hansen said that Jones was "so upset" by the firing of Wade Phillips that he jetted off to Las Vegas.